The Transformation of Football: A Case of Europeanisation? This seminar will present some of the results of a 4 year international collaborative project on the transformation of national football structures. Coinciding with the publication of the book by Manchester University Press, Borja Garcia and Wyn Grant, two of the editors of this collective volume will present a summary of the project as a whole. They will then continue to explain in more detail two of the 10 case studies contained in the book: Spain and England. Finally the seminar will discuss some wider conclusions on the Europeanisation of football. This work examines the transformation of European football in recent years by focusing on the impact of Europe and the EU on the way that the game has evolved in a broad cross section of European states. It brings together two significant research agendas: first, that on the governance of sport in Europe/the EU; second, that within European integration studies on Europeanisation (most commonly understood at the process of change in the domestic arena resulting from European integration). The concept of Europeanisation is used to shape the individual country case studies, but other transformational factors such as globalisation are also assessed. An introductory section sets the context within which the transformation of European football has occurred, with particular emphasis on the role of UEFA and EU institutions. Ten country studies follow, including the five leading football nations in Europe, a recent accession state and a country which is outside the EU. What emerges is the shaping influence of Europeanisation but also the extent to which it is countered and modified by national culture and structures. Also noticeable is the sense of decline amongst some of the footballing nations on the continent. Issues analysed throughout the book include broadcasting rights, transfer and nationality regimes, the development of transnational club forums and European-level club competitions. The transformation of European football will be of interest especially to students of European politics and sports studies, as well as more generally to social scientists interested in sports. It also represents a substantial contribution to the debate on Europeanisation. 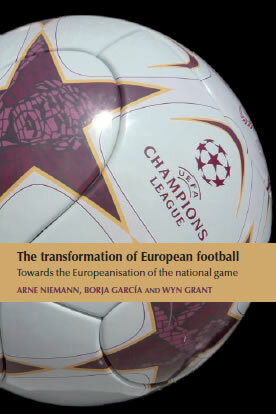 Niemann, A., Garcia, B. and Grant, W. (eds) (2011) The transformation of European football: Towards the Europeanisation of the national game. Manchester: Manchester University Press. Dr. Borja García is Lecturer in Sport Management and Policy in the Institute of Sport and Leisure Policy at Loughborough University, UK. He gained his PhD (Loughborough) with a thesis investigating the impact of EU policies on the governance of football in Europe and has an interest in the development of the EU sports policy and the study of UEFA. Dr. García has researched extensively the impact of EU decisions in the governance of football since the Bosman ruling and has published articles in peer reviewed journals such as the Journal of Contemporary European Research. As result of his research, Borja has advised informally Members of the European Parliament, the English FA or UEFA in issues related to the EU sports policy. Wyn Grant is Professor of Politics at the University of Warwick and co-editor of the website www.footballeconomy.com. He has worked on comparative public policy, particularly in the areas of agricultural and environmental policy, but has extended that interest to sports policy more recently, publishing in British Politics on the political economy of football.